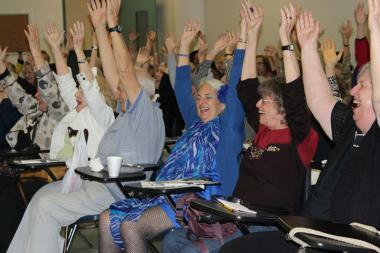 Laughter Yoga at JASA, a social services agency for seniors. QUEENS — More than 12,000 seniors and disabled New Yorkers could be eligible for retroactive rent rollbacks and rebates if they were wrongfully terminated from the city’s rent freeze program, according to the legal team that filed a class action lawsuit against the city’s Department of Finance. The Finance Department is expected to send letters to these individuals in early 2017 stating that they may be entitled to a rent reduction and credit, said Donna Dougherty, of JASA, a nonprofit that serves seniors across the city. Many could receive benefits that are retroactive, dating back to when their benefits were lost. The pending settlement stems from a case Dougherty filed two years ago, in conjunction with Cardozo Bet-Tzedek Legal Services and Northern Manhattan Improvement Corporation Legal Services, against the Finance Department on behalf of eight seniors and disabled individuals enrolled in the city’s rent freeze program. They had either been terminated from the program for failing to re-register in time or were reinstated in the program, but at a much higher rent. The lawsuit alleged that the Department of Finance was administering the program in violation of the Americans with Disabilities Act and their constitutional due process rights. Under the program, individuals are required to re-certify every one or two years, depending on how long their lease renewal covers. They have a six-month window to do so. But the lawsuit alleged that the individuals, who suffered from a range of issues including dementia or other illnesses that land people into frequent hospital stays, should have had “reasonable accommodations” under ADA to extend the window beyond six months. One of Dougherty’s clients, for instance, a woman in her 80s with schizophrenia and early stage dementia, went off her medication and was having an episode that landed her in and out of hospitals over a nine-month period. She ended up missing her six-month window to re-certify the rent freeze for her Sunnyside apartment. JASA helped provide the woman with funds to keep her in her apartment as the organization fought for her right to roll back her rent. In September, a federal judge granted class certification to the group — which is believed to include roughly 12,000, Dougherty said, explaining that the parties are still discussing details about how the rent credit program will be rolled out. According to court papers, nearly 600 individuals were terminated from the program because they failed to re-certify and were subsequently certified on a new application for a new rent freeze — but at a significantly higher rent amount. Finance Department records also indicate that roughly 11,500 individuals — who are apparently still alive and have not moved or lost their benefit eligibility — were terminated from the rent freeze program for failure to certify and their benefits were never reinstated, court papers show. "We know those 600 will be examined for retroactive relief," Dougherty said. "And we want to get the word out. If you were in the hospital or your relative suffered from dementia and you didn’t know and you found their mail from a year ago [about re-certification], this might help." The Finance Department administers two programs that freeze rent for certain low-income New Yorkers: the Senior Citizen Increase Exemption (SCRIE) for those 62 years old and older, and the Disability Rent Increase Exemption (DRIE). For both programs, household incomes must be under $50,000 a year. The program aims to preserve affordable housing for those who would be unable to foot rent increases due to their age or disability since they are often on fixed incomes. The landlord receives a tax credit covering the difference between the tenant’s frozen rate and the legal rent. Because the settlement yet was not finalized, the Department of Finance declined to comment.